Can I just tell you that I'm having a rough day today? Sometimes Life just gets to be hard. I've just been sitting here contemplating this. If it wasn't hard somtimes, we really wouldn't be﻿ grateful for all the good times in our lives. One thing that I've learned to do when I feel this way is to look for the good things in my life. The tender mercies that I am blessed with every day. "...But behold, I, Nephi, will show unto you that the tender mercies of the Lord are over all those whom he hath chosen, because of their faith, to make them mighty even unto the power of deliverance." Isn't that an amazing thought! The Lord is sending tender mercies into our lives. ALL. THE. TIME. he will "make [us] mighty even unto the power of deliverance." What do you desire to be delivered from? A challenge or trial? An addiction? A bad mood? What is a tender mercy? One of my favorite talks of all time is by David A. Bednar. "...the Lord's tender mercies are the very personal and individualized blessings, strength, protection, assurances, guidance, loving-kindnesses, consolation, support, and spiritual gifts which we receive from and because of and through the Lord Jesus Christ. Truly, the Lord suits “his mercies according to the conditions of the children of men” (D&C 46:15)." and giving me strength, guidance and support. the amazingly simple things that make up these tender mercies. A quick note on your door. A kind word from a family member or co-worker. A memory brought back at just the right moment. An silent answer to a prayer. Feeling the enabling power of the Atonement. remembering all of these important things today! that I am surrounded with each day! 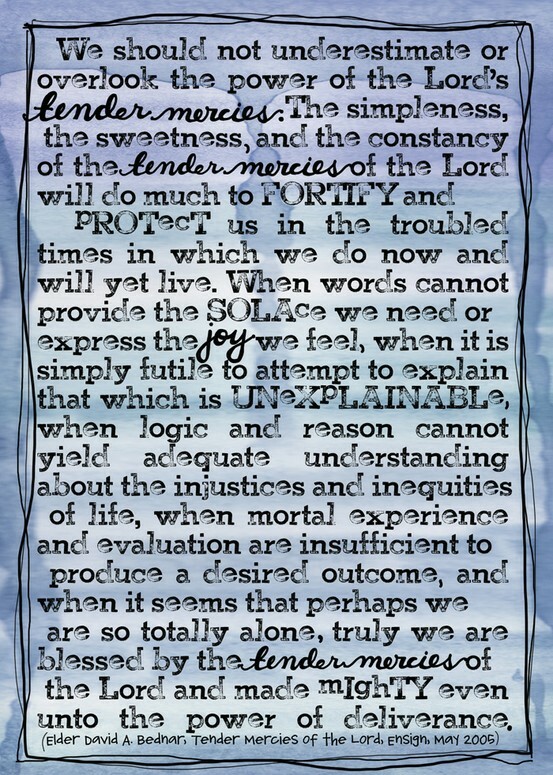 We should not underestimate or overlook the power of the Lord’s tender mercies. 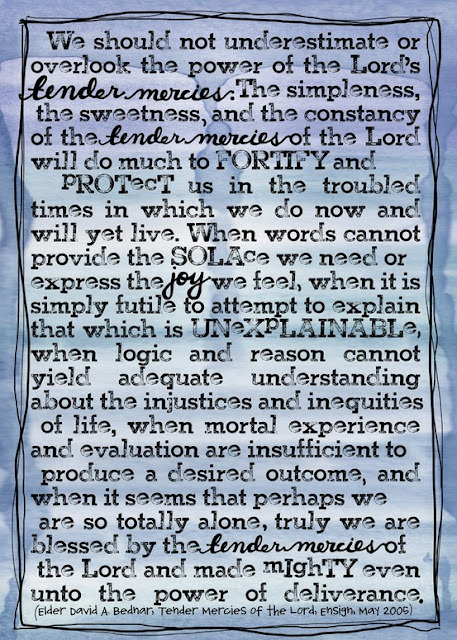 The simpleness, the sweetness, and the constancy of the tender mercies of the Lord will do much to fortify and protect us in the troubled times in which we do now and will yet live. When words cannot provide the solace we need or express the joy we feel, when it is simply futile to attempt to explain that which is unexplainable, when logic and reason cannot yield adequate understanding about the injustices and inequities of life, when mortal experience and evaluation are insufficient to produce a desired outcome, and when it seems that perhaps we are so totally alone, truly we are blessed by the tender mercies of the Lord and made mighty even unto the power of deliverance (see 1 Ne. 1:20). We are never truly alone! The Lord is constantly sending us little "notes" to remind us of His love and His faith in us and our greatness. My challenge to you today is to sit and write a list of what tender mercies you have seen in your life today. My guess is that if you look closely you will truly see all the simple little things that make up the amazing blessings that you have! Last week I had a huge ah-ha! Just thought I'd share it with you! In November somethings shifted in my life. When that happened, getting to the gym in the early morning hours became a chore. Most of the time I didn't make it there. I was feeling very yucky and depressed. In my head I knew that part of my challenge was that I wasn't exercising or eating good foods. Every Sunday night I would make a commitment to eat better and to get up every morning and go to the gym. This had always worked for me before. By the time I got home from work Monday night, I would be exhausted and hungry, and I would sabotage all the good work I had done that day by eating all sorts of things that wouldn't help my body feel better. And so it would go every day. I was also having days where I wouldn't get out of bed to go to the gym. Then came the new year and just like before I began again. I knew I could do it; I'd done it before! I had friends that I could work out with in the mornings! But...I ended up having the same problems. Then one day I didn't wake up in time to go to the gym. and set off to work with a plan to go as soon as I was finished there. When I got finished, I felt pretty good and I realized that I wasn't at home eating yucky food. but I have changed since that time almost two years ago. What worked for me back then, was obviously not working for me now. 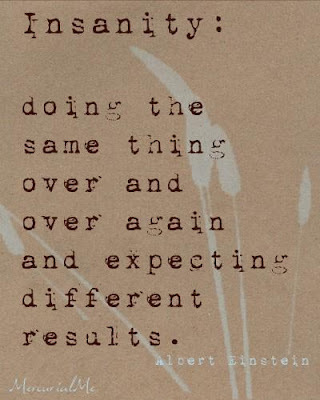 because doing the same thing over and over was simply not working for me anymore! and I go to the gym after work. It's been working really well for me. And I get to hit three birds with one stone: sleep, exercise, and not sitting at home after work eating. doesn't mean that it still does. We are always learning, growing and changing in our lives. Sometimes we get the opportunity to shift our lives to fit the person we have become instead of the person we once were. but for me the best thing about goal setting is that it's a process. but I would fizzle out by February and give up on doing them. Now I realize that sometimes life circumstances change. I'm also learning and growing all the time! finding the paths I have the privilege to be on! This is like writing your own personal mission statement for the year. I love it because I get to think about what I truly want in life. If my life and I were exactly what I wanted us to be what would it look like? To start off with I've found asking myself some questions is a good place to start. I love reading a blog I found called "Making Things Happen". 1. Where do you want to be when your 80? Humble, active, healthy, a faithful servant of my Heavenly Father, surrounded by my family, living a life of charity. 2. Why do you do what you do? I desire to assist others in learning and growing--becoming who Heavenly Father desires for them to be and to assist them in shaping their lives in the way the Savior intented. Ultimately I do what I do because of the love I feel for others and especially the love and gratitude I feel towards my Heavenly Father for blessing my life! 3. What kind of life do you want to life this year? This year I am desiring t live a life of charity and service, keeping and eternal perspective in all that I do. 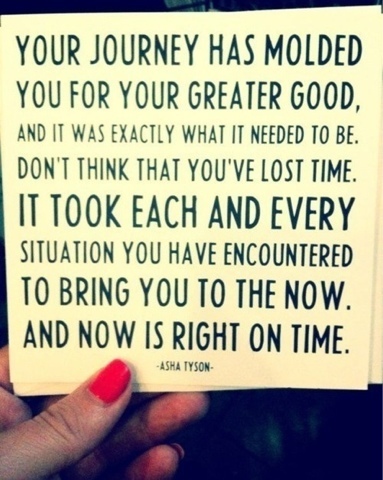 Trusting in the Lord's plan for me and living in my Soulful Brilliance. I desire to be physically and spiritually strong so I can better assist others in finding and living in their SB. I desire to life a life of gratitude and sharing my testimony through word and deed. Seeing others as Heavenly Father does and helping them realize their greatness and potential. And ultimately to grow closer to my Heavenly Father and my Savior. 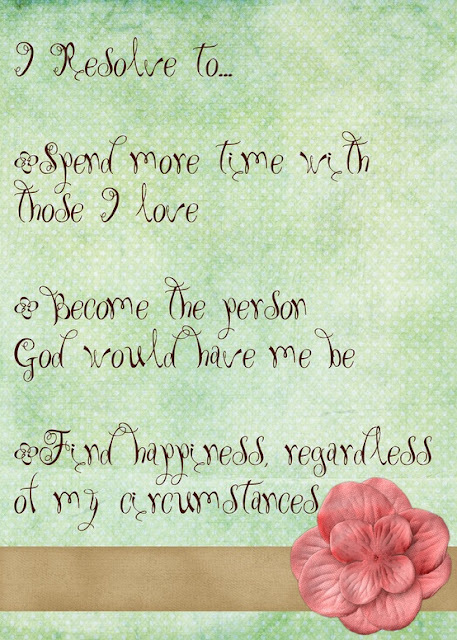 Keeping those things in mind, here is my 2013 vision. Remember while you are doing this that this is a process. You can shift or modify your Vision any time you want. That's the best thing about life! 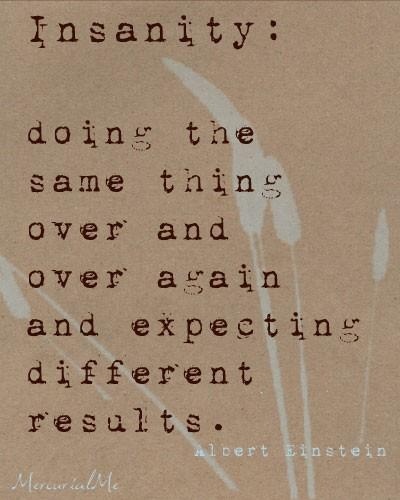 It's always changing! So if you try something and it just doesn't work or resignate with you that's okay! Shift it! I am active, strong, powerful, inspiring, humble, teachable, purposeful, slow to anger and quick to serve, and courageous. I am living in my Soulful Brilliance and dedicating my life to the service of the Lord, to be an instrument in His hands to bring others to the knowledge of their greatness and potential so they can live the lives the Savior intended for them to live. I am trusting in Him and His plan for my life. Step Five: Write down some goals! Here we go! What you've all been waiting for! Let's write some goals! Take a couple of minutes to go over your answers to steps 1-4. Refresh your memory on where you've been, what you've learned and where you wish to go now. Make a list of habits or actions that would assist you in living that vision. Here are some of the things on my list: GOSPEL STUDY, GRATITUDE, FAITH, CHARITY, financial freedom, live in a clean space, and live in my healthy body. -Is this goal in line with my 2013 Vision? 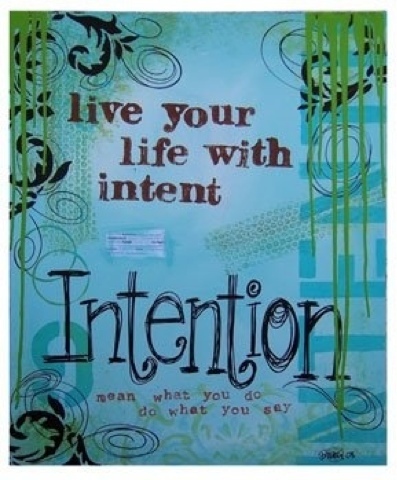 -Does this goal help me live in my soulful brilliance? -Does this goal assist other people too? -What is my motivation for doing this? Why should I spend my time on this goal? If your answer is no or you don't really have good motivation to accomplish a goal, then maybe you should find something else to work on that will be worth spending your precious time on. Writing down your motivation (the WHY you are doing it) for accomplishing a goal is super important! In order to truly be able to accomplish anything permanent, we get to be connected to it with our hearts. When I first started my 90 Day Mind-Body Transformation with Marci Lock, she asked me why I wanted to do it. Essentially it was to lose weight and learn better ways to work out. Heart connection? Nope. Digging deeper with her that day I discovered that what I really wanted was to be at peace with myself and my body. My weight was just a number. Would I have been happy losing 25 lbs? Yes, but would it have been a lasting happiness? Nope. Even after finding that peace with myself and my body and finding my soulful brilliance, I still allowed my old beliefs back in to my life for a while. I hated myself and my body again. How grateful I am for the tools I learned to get back on track and remember my true motivation for keeping my body and mind strong and healthy! I've been able to stay connected to different groups that have done the 90 Day Program that I did and it was very interesting to see everyone's different motivations for doing it. The people who are successful are the ones who have a true heart connection with their goals in the program. Sadly, many people doing the program didn't have that heart connection with their goals and were not able to be lastingly successful. So sit down, write your goals, answer the above questions and especially write down what your motivation is for doing it! Goal Setting Part III: Joy! Here comes one of my favorite parts of the goal setting process! Sit down and make a list of at least 30 things that bring you joy! My Making Things Happen friends call this "What fires me up!" where we feel like we don't want to accopmlish things. If we don't choose to feel joy in our journey each day, we can end up miserable and not getting anything accomplished. So this is a list of things you can do to choose to have joy and to get through the tough times! It's SO important to take care of yourself and be sure to feed your soul so you are better able to lift and assist others! What brings you joy? What fires you up? Write a list of at least 30 things and then choose to do something each day to feel joy! Please share some in the comments below so we can give others some ideas! Remember that if you comment you will be put into a drawing to win some prizes! Yay! We survived the field trip with only one carsick (or is it bus sick?) kid! Okay, so before I start on telling you a little more about step three. I would like to share some more about what I wrote for steps 1 and 2. Step One: What were my wins in 2012? 1. Well the first thing I wrote down was starting this blog. I remember the day I got this big ah-ha about it. I had started another blog that I called enCOURAGEment, but I wanted it to be something more than it was. One day in the springtime I was out hiking with Britt. We have this special trail we like to hike (mostly because it's not well known and so you hardly see anyone on it). We're hiking along having our normal deep conversation while we're out enjoying nature and getting a workout all at the same time. I start telling her about this blog I started and how I wanted it to be more. She was giving me more ideas about it and all of the sudden we decided to have this adventure together! We spent the next few days brainstorming and getting a lot of ideas for what we wanted to do with it. It has been our hope in the months since to touch the lives of other women and inspire them to live up to their greatness. It has been a very good learning experience! 2. I ran three different half marathons! One of them was even a trail half marathon! Besides this being a pretty big accomplishment. The even better win for me was letting go of what I think running races looks like. I have run races for a few years now, and I was always getting stuck on what a "real runner" looks like and acts like. I didn't fit into my looks like and acts like lists and always felt that I wasn't a "real runner". Now I say to myself, "Hello! You ARE a real runner! You went and ran that race and FINISHED!" 3. The last thing I'd like to share is that I allowed myself to be more adventurous. I got on a horse and rode it all by myself! I went snowboarding out in the cold wet snow! I went rock climbing even though I am terrified of heights! I did all those things I let go of all of that fear and allowed myself to live! Wow! That's a great reminder! Let go of fear and let faith take over! That is truly living! Now for Step Two: What didn't work for me in 2012? This one was hard for me at first because I've been struggling with not beating myself up about things, so in an effort to stick to the facts this is pretty short. 1. I started to avoid exercising by using the excuse that I was too tired and needed more sleep. 2. I stopped making lists at school and started living just one day at a time. I'm still a good teacher, but it has made me more stressed out during the week because I have to think more about what I'm teaching the next day. Hasn't really worked with me desiring less stress in my life. 3. I worried too much about things that weren't important. Step 3: What three things did I learn from my wins, and what three things did I learn from my losses? 1. The biggest thing I learned through all my learning opportunities was that I can't do everything by myself. I particularly learned this at work as I have a few "special students" as I said in my last post. I get to ask others for assistance, ESPECIALLY my Heavenly Father! Thanks to the enabling power of the Atonement, my Savior can take my Best (even though it isn't always that great) and make it into something stronger and more amazing than I ever imagined! 2. I learned that loving someone unconditionally doesn't mean accepting and giving into something less than you really want in your life. Sometimes you get to love them without condition, but not let them be in your life...I got to stick to my standards! 1. First I learned that worrying is pointless. I get overwhelmed and end up doing nothing at all. I live from day to day and I'm not progressing as I live that way. 2. I've learned how important studying the Gospel is in my life. It lifts and inspires, teaches and heals. I haven't dedicated enough time to it, and I know that as I shift that and be more consistent, LIFE WILL BECOME EVEN MORE THAN I EVER IMAGINED! 3. I also learned that I spend entirely too much time on social media and such. I spend time on it to avoid problems and therefore never get much solved. THE BIGGEST LESSON THAT I LEARNED IN 2012 IS THAT EXPERIENCES COME INTO OUR LIFE TO HELP US GROW INTO THE PEOPLE THAT HEAVENLY FATHER DESIRES US TO BE! STEP THE THIRD: WRITE DOWN THREE THINGS YOU LEARNED FROM YOUR WINS AND THREE THINGS YOU LEARNED FROM WHAT DIDN'T WORK FOR YOU. This step for me can be a struggle to write . Both because sometimes I don't know the answers right off and because it can get pretty emotional for me. We've just arrived at our destination, So check back later and I'll share more of my answers to steps one through three. Have a great day! With this new beginning many of us sit down and make new goals and resolutions for the next year. I've been spending a lot of time this last week looking back at 2012 and working on my goals for 2013. It's got me all excited for the new year ahead! I'm about to share my process of goal setting, so take out your journals and get ready for some fun! I'm also desiring some action and comments here on the blog, so if you are one of the many people (We just passed 1,100 hits this week) who are reading this and have been a lurker (a person who looks, but does not participate:0)), lurk no more! Share your stories and successes so others can be inspired by you! What were your wins in 2012? What worked for you? What were your successes? What are you most grateful for? Some people might think that this has nothing really to do with making New Year's resolutions, but we truly need to CELEBRATE all of the good things that happened in our journeys this past year. When we do we are attracting more positive things into our lives! Plus, it's a good reminder of how blessed you truly are! As I've been working on this I made a goal of writing down at least 30 wins I've had in the last year. At first it was hard and was big things like starting Soulful Brilliance and running three half marathons. I got about five big things written down and then I was stumped! I then took a look at my 2012 journals and started remembering more of the little things I could write down as wins. Finding my cat Binx, spending fun time with my nieces, riding a horse all by myself, snowboarding for the first time, rock climbing for the first time....and so much more! 2012 was a good learning process for me, and I've been grateful for the chance to go back and take a look at how far I've truly come! What didn't work for you in 2012? Be honest, but don't beat yourself up about it. Just stick to the facts! In the words of a friend of mine, "The past is just that...the past." You have a soulful brilliance, a greatness, inside that makes you...you. We need to acknowledge what didn't work for us last year so we can create and even more amazing year in 2013. For me some of these things were avoiding exercising and making lists at work and then not using them to use my time wisely. Doing this gave me some good ideas for new goals. Step the Second challenge: Write down what didn't work for you in 2012, sticking to the facts. So let's get busy and don't forget to share! Check back tomorrow for steps three and four! *I've pulled my steps of goal writing from many different mentors and sources. Check out their websites: Making Things Happen, Tiffany Peterson, Ann Webb and Marci Lock. Big thanks to them and their assistance in my growth process!